Learn the basics of working in acrylics through demonstrations and one-on-one coaching while exploring materials, color, design and technique. Learn how to work with a blank canvas, changing fear into inspiration! All materials will be provided. LeeAnn will use her own originals as examples during the class. Gentle yoga and hot stone relaxation to help you stretch, center, and relax into the day's painting journey. Nutritious lunch of savories and sweets and champagne will be served. Guided journaling to assimilate the day's experience and channel your creative juices into new insights and fresh possibilities! LeeAnn Brook has painted in acrylics for over 40 years and has taught workshops for the past 8 years. 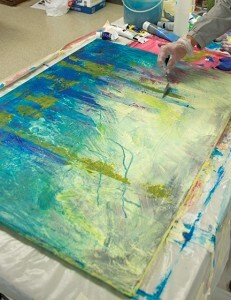 Her experience as a professional painter brings a unique opportunity for students to learn firsthand.